This weekend I started a project that was a bit out of my real of expertise. I finished the project, and while I am extremely pleased with the results, I will never attempt something like this ever again. I give you the epic journey that was...THE CAT TOWER! It all started a few weeks ago when I thought that it might be a nice little project--you know something that the kitties (not to be confused with kiddies) would enjoy. My mom was supportive. She offered up something like, "well, sure we can!" I did some research and decided that this project was the winner. I'm really happy with the finished results, but this pattern was very confusing and it definitely made you work for your cat tower. Step 1: Get supplies. Nick and I ventured up to Tacoma on Friday night to Lowes hardware store. A nice young man named Garrett helped cut all the wood we needed. I hadn't been to Lowes in quite some time. It was very overwhelming--it's a big store and I didn't know what lag screws were. Step 2: Drive back to Tacoma the next morning and spend a lot of time figure out how to begin. 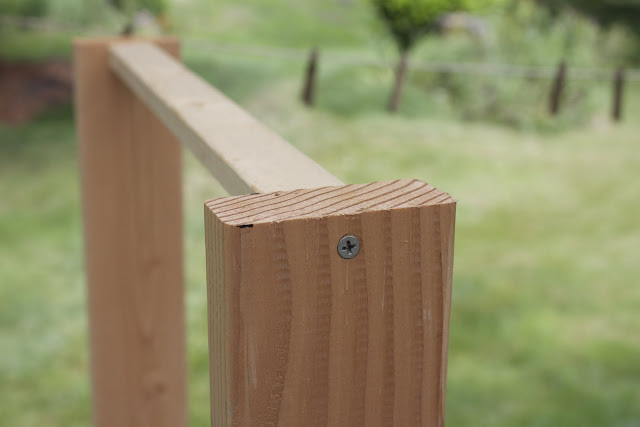 Eventually you realize that you need to screw the posts together and drill some holes into your base board. There's some recess bits involved and some washers, screws, drills, and screwdrivers. I also used some wood glue. 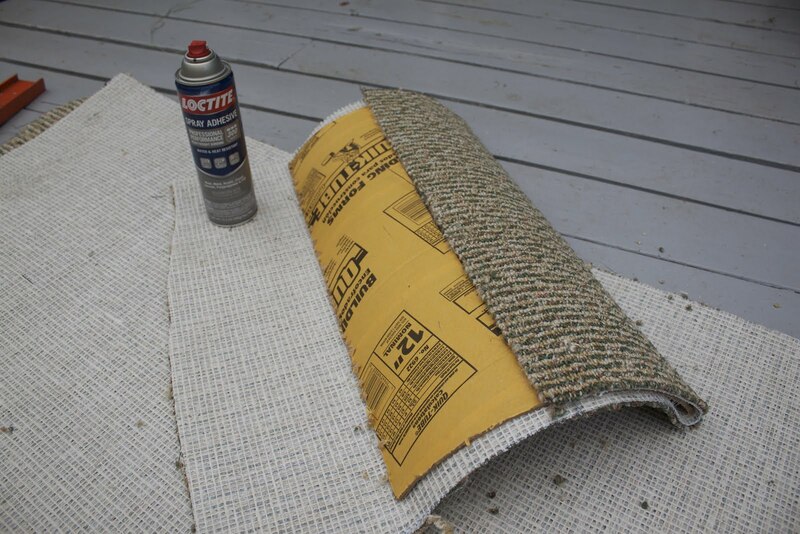 Step 3: Carpet your base. I chose a nice indoor/outdoor blend that I think the cats will fancy just fine. This is really a two-person-job. One person needs to pull the carpet tight and then the other person uses the staple gun to secure the carpet. That would be the carpeted base (2x2). Step 4: You have to cut out the bottom screw holes that you would have made earlier. These have to be accessible to attach your perch posts. After you drill the holes, you use a recess drill bit (3/4 inches) so that the tops of the screw don't scratch your floor. Cut out the holes you drilled using that there blue/black carpet cutter. Step 5: There's a shelf in the pattern as well. 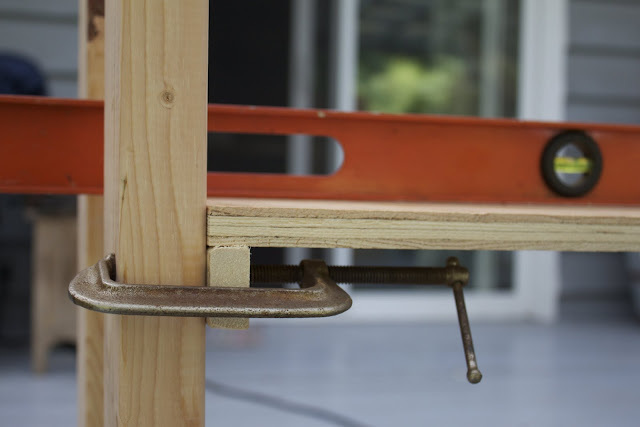 It suggests clamping it in place first, making sure it's level, and then securing it with wood screws. 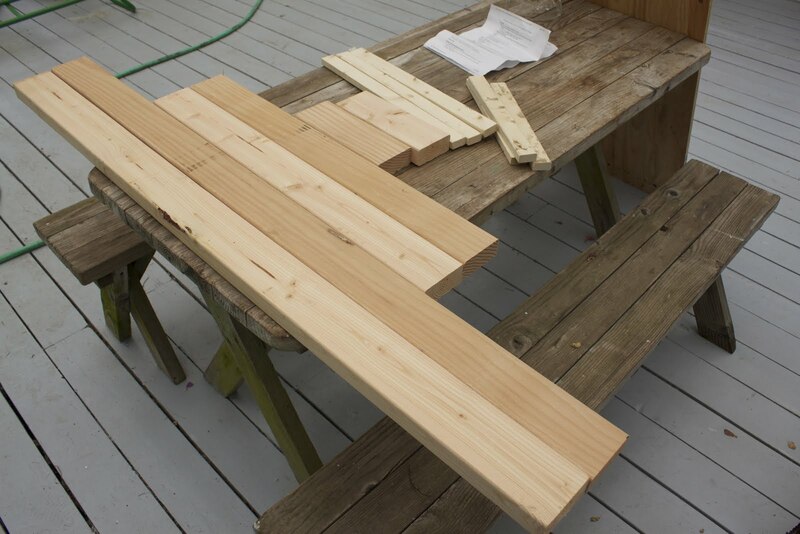 Step 6: Cut the tops to the perches. The perches are compressed cardboard forms used in the creation of cement pipes. It comes in one length at Lowes. I think it was around $8. You need to cut it down to 22 inches. I used a circular saw. You want to cut the tube into thirds. Step 7: After your perch tops are cut, you need to cover them in the indoor/outdoor carpeting. I found that a spray adhesive works best--mine came from the craft store. 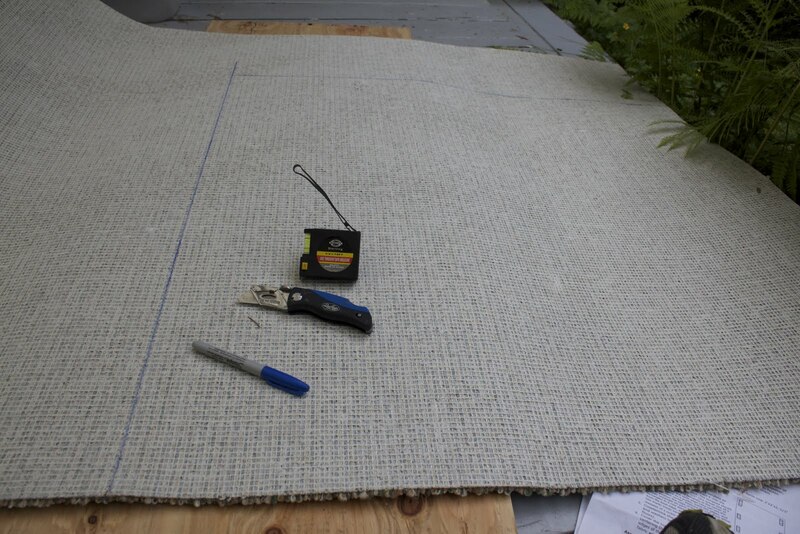 Measure the length you'll need to cover top and bottom, mark the carpet, and cut it. Then you'll spray both the perch and the carpet with the adhesive. 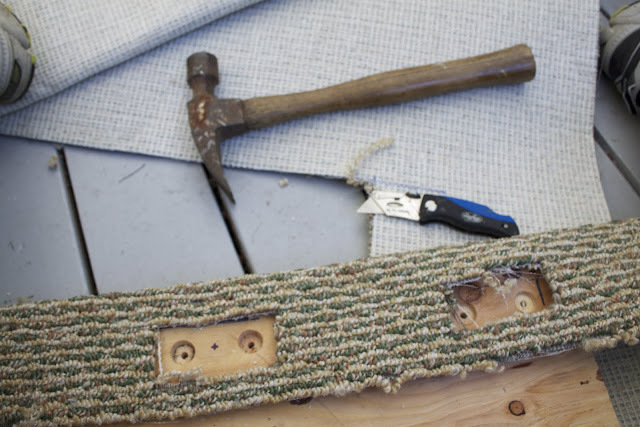 Then you'll use your staple gun and make sure everything is extra secure. 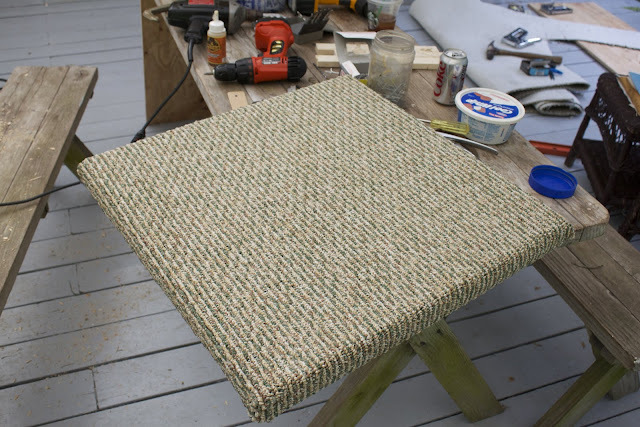 Step 8: After all the perches are covered, I decided to add some trim to the edges to help keep the carpet from fraying. I used thick ribbon from the craft store and hot glued it in place. Step 9: Secure the perches to the stand using two screws on each side. 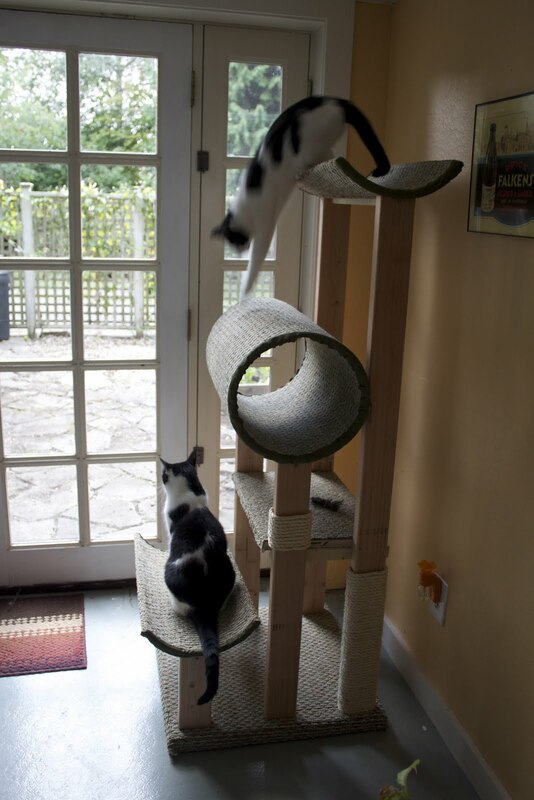 Now it's time to introduce the cat castle to the cats! Word to the wise...buy one in the store. There's a reason they're so expensive; they're a lot of work. Great job and thanks for the tip! good for you! 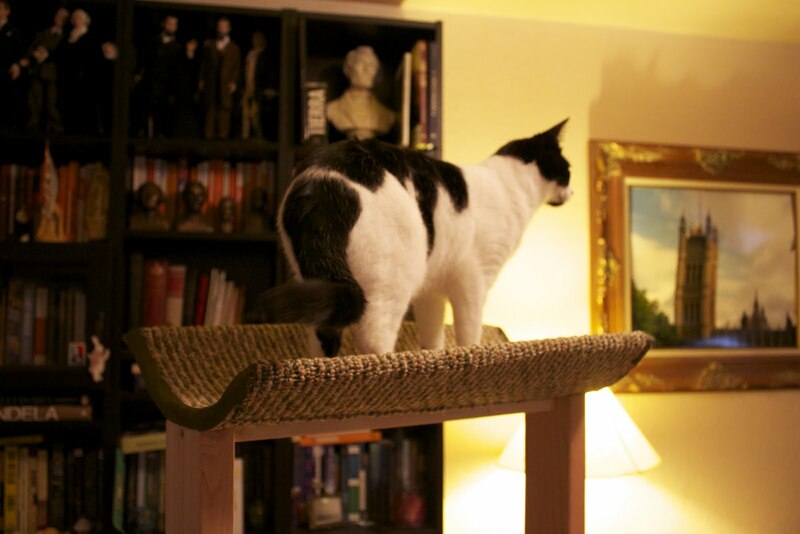 If the cats agreed to get on it, it means it is sturdy and cat-worthy. I agree with your word to the wise!! These things are a huge project! I think it was $95 because she paid Lowe's to cut the wood to the final length. If you have any scrap lumber and/or carpet remnants laying around it'll be even cheaper. However, I need info. Which store did you find the roll of carpet as shown on the middle right of picture #1? I bought all my supplies at Lowe's. The only things I didn't purchase were the spray glue, the carpet cutter, and the power tools. Everything you see in the first picture on the blue rack came from Lowe's. The indoor/outdoor carpet is in the outdoor section (with the astroturf) you buy it by the yard I believe. Best of luck to you, I must say that I do get extra satisfaction knowing that I made it myself, and the cats still really enjoy it. Most carpet/flooring stores sell carpet remnants fairly cheap. Call ahead and ask to save time. Thanks, sorry for the delay. Just saw your reply 5 mins ago, even though since your post, I did search at our Lowe's here. None to that particular carpet, ufff!. No one even knew what I was talking about!. Meantime I'd keep an eye for those as yea, I know mine felines will lovvve your masterpiece!. My kitties are now scratching on those flat cardboard 'planks', luckily saved last minute from a package, leaving flakes all round. Hmm that's too bad. I would think all Lowe's would carry some form of it. Well, don't give up. 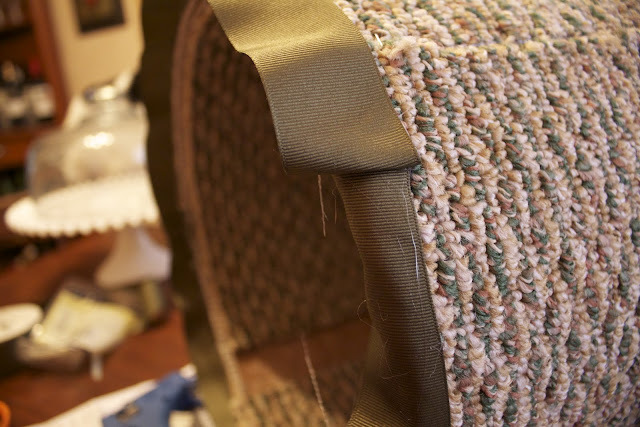 I think the key is to find indoor/outdoor carpeting somewhere--it's a little bit more coarse so the cats seem to enjoy scratching and rolling on it more. Thanks and Happy August to you too! Thanks for the tips! We made a small cat tree out of a couple of those tubes for our cat back when he was smaller. We used regular indoor carpet and it worked fine. The only trouble was gluing it down - it didn't want to stay put and I hated using staples as I was afraid he might catch his claws on them. 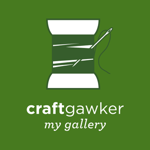 If we ever make another (I finally bought one on sale), I'll try craft glue. It's a lot of work right? Yeah I was a little nervous about the staples, but they have stayed down just fine. The spray glued really held too. I just checked the pattern and this is what it says, "two (2) 8'x2"x4" pieces of lumber, each piece cut into (1) 4'-6", (1) 2'-9", and (1) 9" lengths." I'm sorry, but for 95 dollars you may as well have spared yourself the work and purchased a cat tower. I think it was $95 because she paid Lowe's to cut the wood to the final sizes. Cutting it yourself will save money. 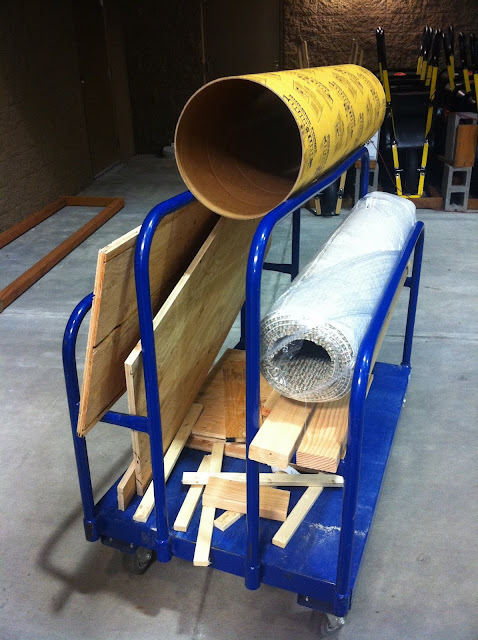 Plus, if you have any scrap lumber and/or carpet remnants laying around it'll be even cheaper. 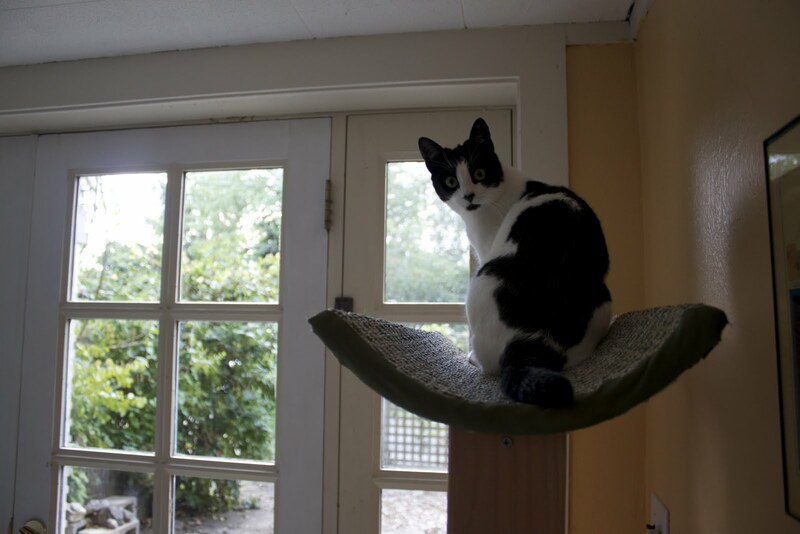 Just saw your cat tower...nuts with the words to the wise! Those expensive things in the stores are cheaply made (probably in China!) and not stable at all...yours looks beautiful. You get what you pay for.....$95.00 sturdy and well built....cheaper from a pet store- cheaply made and fall apart way too soon! Really cute post, and yes, they are expensive to make...but you did a fabulous job! I have a question about the middle tier, do your cats have any trouble getting into the tube from 3 feet down? 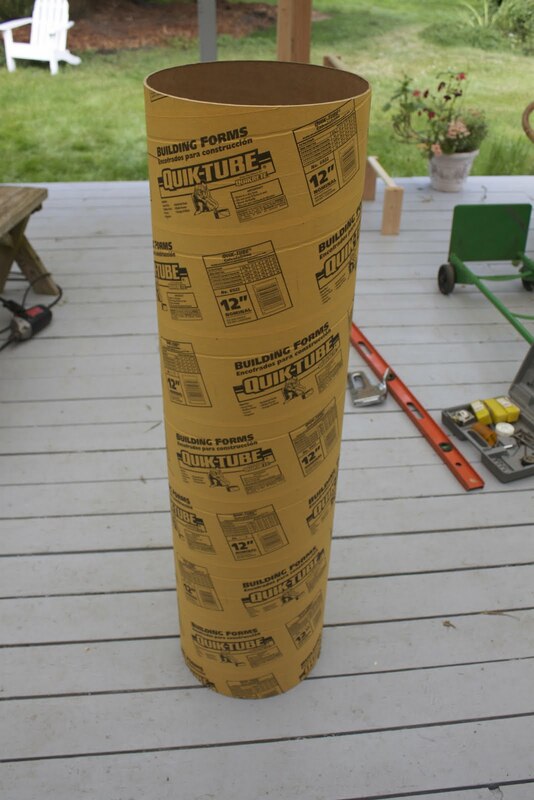 I'm making this on the weekend - I had all the wood lying around at home, so I only spent $30 on carpet and the tube. My only concern is that my kitty won't be able to jump into the enclosed tube from the ground. 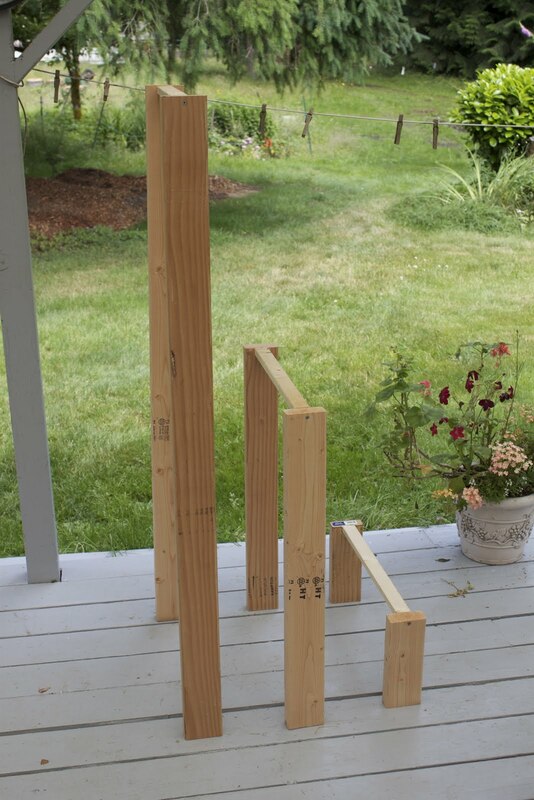 So, I'm actually in the process of building a new cat tree for my kitties. Your project was an inspiration to my design. I think I probably spent around 65 for all of my supplies...and that's a max total. I don't like ones out on the market, the carpet is ugly or not what I want. I'm doing exposed stained wood and berber carpet. Amazing! I like this diy project so much!